Wine country can be a very romantic setting for many couples. Fred Guanlao and Louvena Mallari are frequent visitors to Niagara Wine Country. The couple, who have been friends for 9 years and together for 4 years, visit annually to enjoy a romantic weekend away from the city. 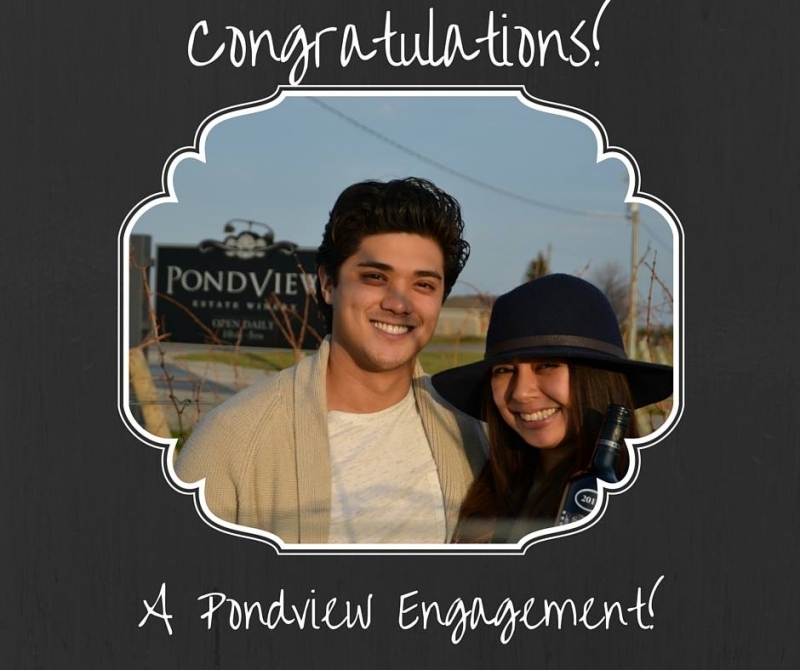 Just before the Christmas holidays, Pondview was able to be a part of a very special moment for Fred and Louvena. Fred had contacted us months before – and we helped him create the perfect atmosphere for Fred to ask Louvena a very important question. He had sent us wine labels, that we used to relabel their favourite Pondview red wine. When the day came, we took them into our cellar for a private tasting. The couple were enjoying a private Bella Terra Tasting Experience; a tasting that includes 4 of our Premium Bella Terra wines with different cheeses. At the end of the tasting, our Wine Consultant, Tammy, presented Louvena with the personalised wine that read, “Will You Marry Me?” on the front. She turned around to see Fred on one knee and said yes through tears. Fred chose Pondview for this moment because the couple had visited the winery before and Fred knew that the smaller scale winery would set the perfect atmosphere for such an important memory in their lives. We would love congratulate the lovely couple once again! If you are looking for a romantic experience for you and your loved one, visit us on Valentine’s Day to enjoy our Chocolate Making Workshop and Wine Pairing Event and spend the afternoon in our cozy cellar!